Saw the movie first and absolutely loved it. But I always come back to the books. Books are good for the soul and Nicholas Sparks does such a wonderful job feeding mine. I love his books and always will. He brings romance to another level and I will forever wonder if that kind of romance exists as it does in his stories. Absolutely loved the movie and thought the book would be even better as it usually is. I learned however opposite the movie, there was more history in Noah and Ally as an older couple than there was about them younger which after seeing the movie made me think that was the part of the story that really built up the type of love they had. Seeing them go through all they did when they were younger made the times the book focused on them being a part so much harder to bear that when they did get back together you found even more relief for the characters. The way the book is written lacked that affection from be but nonetheless was a good story and very well written. for the first time ever for me, i actually enjoyed the movie better. As far as the narrator he was very good but i definitely didn't like the music being played at parts while he was still reading. It was in my opinion, bad music and too loud that i couldn't focus on what he was saying at such an important part of the story because I was trying to tune out the music. I absolutely loved this. A beautiful love story. The movie was fantastic. Love Nicholas Sparks and love this book! Once again, he has managed to tug on my heart! Such a great read and tear jerker! 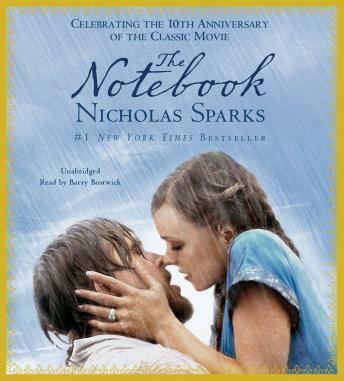 I love Nicholas Sparks and I enjoyed this book. I have seen the movie and it is one of my favorites, so I decided it was time to read the novel as well. I haven't seen the movie (I try to stick to reading the books first) which I hear is AWESOME. I really hope it is better than this sappy book. Where was the climax? I think maybe a lot of his books are this way but the movie hype had me expecting more. Excellent! Well worth the time listening! What a great storyline! I did not enjoy this book. It did little to keep my attention and was focused on the end of their lives and not the enjoyment of their earlier lives together. Reading past love letters did not seem the best way to write a story. This is one of the best books I have listened to in a long long time. It is a great love story and done with great taste. I would recommend The Notebook to anyone. I enjoyed it tremendously. Very touching story. Didn't like the intermittent music too loud. And at times the reader was hard to hear.